An Ariane 5 booster blasted off Friday with nearly 7.3 tons of cargo bound for the International Space Station inside an unmanned resupply freighter, becoming the heaviest rocket and spacecraft ever launched by Europe. Two solid rocket boosters and a clean-burning hydrogen-fueled engine ramped up to 2.6 million pounds of thrust to push the 856-ton Ariane 5 launcher off the ground at the Guiana Space Center, a European-run spaceport in Kourou, French Guiana. Liftoff was at 0434 GMT (12:34 a.m. EDT), the moment when the space station's orbital plane passed over the launch site in the Amazon jungle. The Ariane 5 rocket quickly rose from the launch pad, pitched on a northeast trajectory away from the South American coast, and traversed the Atlantic Ocean in about 20 minutes. The launcher's upper stage placed the European Space Agency's third Automated Transfer Vehicle, a robotic resupply craft, into a 160-mile-high orbit to begin a nearly six-day chase of the International Space Station. The 43,462-pound vessel, about the size of a double-decker bus, deployed from the Ariane 5's upper stage at 0538 GMT (1:38 a.m. EDT). The spacecraft unfurled four solar array wings shortly after 0600 GMT (2 a.m. EDT) to begin generating electricity. "This is not yet a success for ESA," said Jean-Jacques Dordain, the agency's director general. "I shall say five months from now if this is a success. This is just the start of a very long journey which will take Edoardo Amaldi in space for the next five months. It's a good start, a very good start." ESA's third resupply freighter is nicknamed Edoardo Amaldi after the Italian physicist who made groundbreaking discoveries in nuclear and particle physics and helped foster the precursor to ESA. Later Friday, the ATV was supposed to extend a boom antenna. The first in a series of rocket burns to raise its altitude and catch up with the space station was also planned Friday. Docking with the space station's Russian service module is scheduled for 2232 GMT (6:32 p.m. EDT) on Wednesday. "After this new launch success, ATV 3 has now to achieve its automatic rendezvous with the ISS at a speed of 28,000 km/hr [17,400 mph] within a precision of less than 10 centimeters [3.9 inches]," said Alain Charmeau, CEO of Astrium Space Transportation, in a statement. "This rendezvous in space uses one of the most cutting edge technologies that Astrium has developed as system integrator for ATV to be ready for future challenges." Several dozen firings of the ATV's engines are programmed before reaching the space station, and the ship will also extend its docking probe. 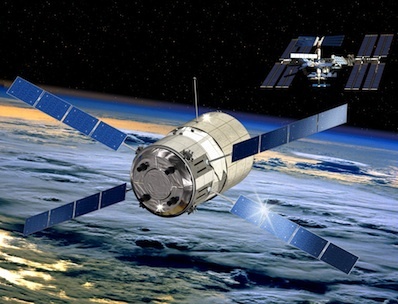 Navigating with relative GPS satellite technology and a vision-based laser system, the freighter will stop at predefined hold points on its final approach to give ground controllers opportunities to evaluate the spacecraft's health and performance. Once the ship reaches the space station, it will remain attached to the aft port of the Zvezda module for more than five months. The space station crew will spend more than 80 hours unloading Edoardo Amaldi's pressurized cabin and refilling it with trash before the craft undocks in September. Officials will guide the ATV to a destructive re-entry over the Pacific Ocean, vaporizing and dispersing the space station's garbage. ESA developed the Automated Transfer Vehicle to help pay the agency's share of the station's common operating costs. NASA has access to much of the dry cargo capacity on each flight. A single ATV mission costs about 450 million euros, or $597 million, according to ESA. Engineers packed eight supply racks into Edoardo Amaldi's pressurized section, two more than flew aboard previous ATV missions in 2008 and 2011. The spacecraft's total dry cargo load is more than 4,800 pounds, including fresh food, clothing, crew personal items, experiments and spare parts. The rear section of the Edoardo Amaldi spacecraft contains propellant and gas tanks with 12,000 pounds of rocket fuel and oxidizer. About 1,900 pounds of propellant will be pumped into tanks inside the space station. The ATV will deliver 220 pounds of oxygen and air and replenish the station with 75 gallons of potable water. Two more Automated Transfer Vehicles are under construction for launches in 2013 and 2014. "Building, integrating and launching an ATV each year is a big achievement for European industry," Dordain said. Friday's launch capped a feverish six months at the Guiana Space Center, which included the first two flights of Russia's Soyuz rocket from the South America spaceport. The Italian-led Vega launcher made its first mission from Kourou in February. "The launch of Soyuz in October, the launch of Vega in February, and the launch today with Ariane 5 and ATV. It's a fantastic six months," Dordain said. "Today, the picture is very different than six months ago, meaning that we are now a significant space power." 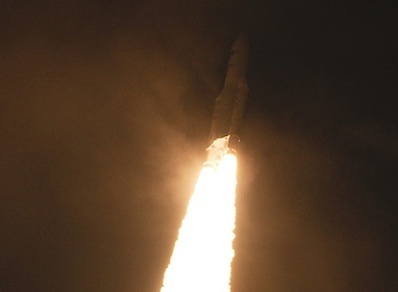 The launch marked the 61st mission of an Ariane 5 rocket, and its 47th straight success since 2002.